The BBC’s Today Programme on Monday mentioned that 17th January is the darkest time of the year emotionally. The hype of Christmas and New Year has gone, and most of our resolutions have already fallen by the wayside. Instead, we’re left with the reality that life continues to chunter along, much the same as last year. But, at the same time, everything has changed. The Menopause book that ate up six months of 2010 is done. My MA in creative writing is also done. And I have a new office in the garden. 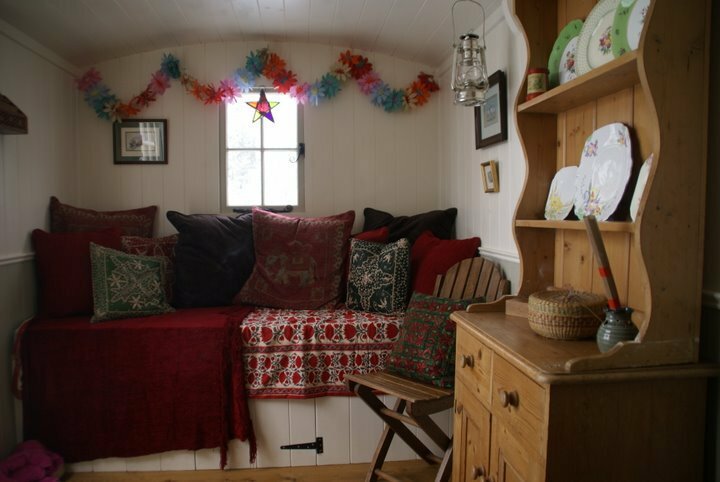 A shepherd’s hut, which arrived a few days before Christmas, complete with woodburner and bed upon which to recline. It is cosy in the extreme, and feeds that part of my soul which resonates with the bare-foot gypsy I was as young woman. Sitting in my hut, it’s strange to think that I was once someone without roots or responsibilities. Even though there were plenty of downsides, life was always exciting – and hell. If something or someone didn’t work out, I just moved on. So it was difficult for me to form relationships that lasted, or work at something that I could build into a career. Yet this freedom allowed my spirituality to flourish, albeit with flowers in my hair. Then, one day I realised I wanted to contribute something more substantial to life. So, I guess bare-foot gypsy girls grow up just like any other young woman. As soon as the thought surfaced, it felt like the universe broke into a broad smile and began to put opportunities my way to do just that. The more structure I built into my life, the more my creativity developed, and the rest, as they say is history. Husband. House. Career. Routine. Nevertheless, my wonderful, magical hut puts me in touch with that spirited (aka irresponsible) part of myself that I had to sacrifice in order to do the work I want to do (writing is about discipline, routine and dedication) and reminds me that life is a constant source of surprise and compromise. So at this darkest period of the year, I am taking to time to reflect on the life journey I have been on, and marvel at how it has led me to the life I now lead. Something I could never have imagined or even wanted as a young woman. Above all, I am using this day to be grateful for what I have in this moment, knowing, as with the manner of all things, this too, will change. This entry was posted in About Sue, All posts and tagged ageing, life journey, menopause, shepherd's hut. Bookmark the permalink. That is so so so so beautiful! I could hardly hear what you were saying in this post, so loud was my envy. It’s often struck me that some of the most successful and effective folk around are onetime hippies. I deplore and regret the absence of boho youth in my own life. Interesting what you say about structure and routines. Discipline frees us up much more than it constricts us, doesn’t it?